This book is a chronicle of the season of the 1973 Jets, covering the team and the head coach from the beginning of training camp thru Weeb's induction to the Indiana sports hall of fame in the following offseason. The reader gains an interesting portrait of the life of an NFL player in the late 1960s and early 1970s, and a brief but interesting history of the Jets early ownership and the interplay between the owners and the football management and coaches.However, the main theme of the book is Weeb Ewbank, the Jets head coach and general manager. He was hired in the early 1960s, drafted Joe Namath and took the Jets to a win in the Superbowl, and then managed their slide back down to the terrible 4-10 season of 1973. During the season the author interviews Weeb's employers (Jets and Colts ownership), people who coached with and against him (such as the legendary Paul Brown), and many fellow players and coaches from Weeb's earliest days as a high school athlete thru this final season coaching in the NFL, and presents a touching portrait of Weeb as a man and a coach. One of the best "year-in-the-life" accounts I've ever read. 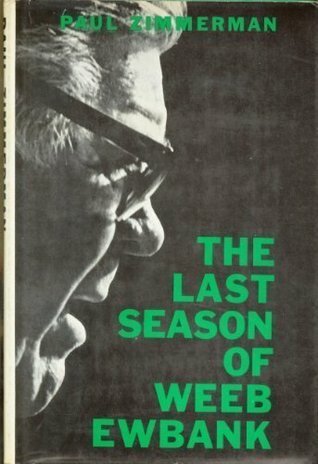 This book--which is constructed out of Paul Zimmerman's regular NY Post columns, with some new material added to flesh out the narrative--tells the story of Weeb Ewbank, the shrewd and easygoing anti-Lombardi, and the team that he'd spent a decade constructing and was now in the process of losing. The aging Ewbank, who has been all but forgotten despite having won three championships over the course of his twenty years in the NFL and AFL, developed both Johnny Unitas and Joe Namath into Hall of Fame-caliber quarterbacks, but was in his late 60s during the '73 season and simply too tired to launch another rebuilding project. Zimmerman, who played college and semi-pro ball, does a fine job of depicting the interesting personalities on this team: John Riggins, a loose cannon from Kansas who represents the "counterculture" athlete of the 70s; Jim Nance, a former MVP fullback now old, fat, and desperate for one last shot; Joe Namath--who never spoke directly to Zimmerman, owing to a grudge that he held against the writer--as his body slowly disintegrated; Winston Hill, the immense veteran tackle nearing the end of his career. The story that unfolds is both poignant and understated, using one case study to evoke the inevitable and unpleasant "last seasons" that await all of us. It's a shame that Zimmerman--whose enormous literary output is mostly uncollected--may never write again.